Prime Minister Sheikh Hasina has said the trial of those involved in corruption, terrorism and militancy must be held as the government wants to build a peaceful environment in the country, UNB reports. "I want to tell you just one thing that those who will indulge in corruption, terrorism and militancy must face trial," she said. 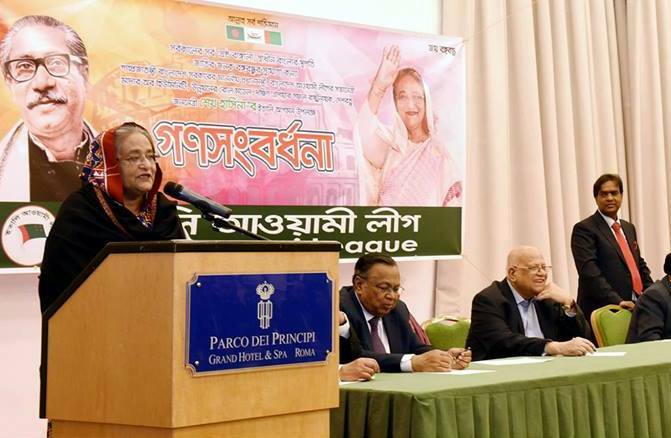 The Prime Minister was speaking at a reception accorded to her by Italy unit of Awami League at Parco Dei Principi Grand hotel here on Tuesday with its president haji M Idris Farazi in the chair. She said the government wants to develop the country with changing the fate of people. "This will be possible only when we we'll be able to check and eradicate corruption, militancy and nepotism," the PM said adding that the prime goal of her government is to develop Bangladesh. Sheikh Hasina said she and her party is there in power to change the fate of people, not to indulge in corruption. Recalling the illegal capture of power by Ziaur Rahman, she said those who had grabbed power illegally cannot give anything to the nation. "I'm the daughter of the Father of the Nation, and pursue the politics. Why should we indulge in corruption luxury?" she said. About the recent verdict in a case where BNP chairperson Khaleda Zia was convicted along with others, Hasina said the case was filed by Khaleda Zia's favourite people Moeen Uddin, Fakhruddin and Iajuddin. "Awami League didn't lodge the case." She said BNP people are questioning the justification of giving the punishment just for only Tk two crore, and there some intellectuals too who are supporting this argument. "That means there'll be a ceiling of amount of money to commit corruption which will be legal. Are they trying to say that?" she questioned. Hasina suggested BNP to go for filing a writ petition with the higher court saying that they can commit corruption up to this level. "Being a former prime minister, Khaleda Zia whitened black money. Where that money came from?" she said. The Prime Minister said whenever BNP comes to power it turns the country into a den of corruption.